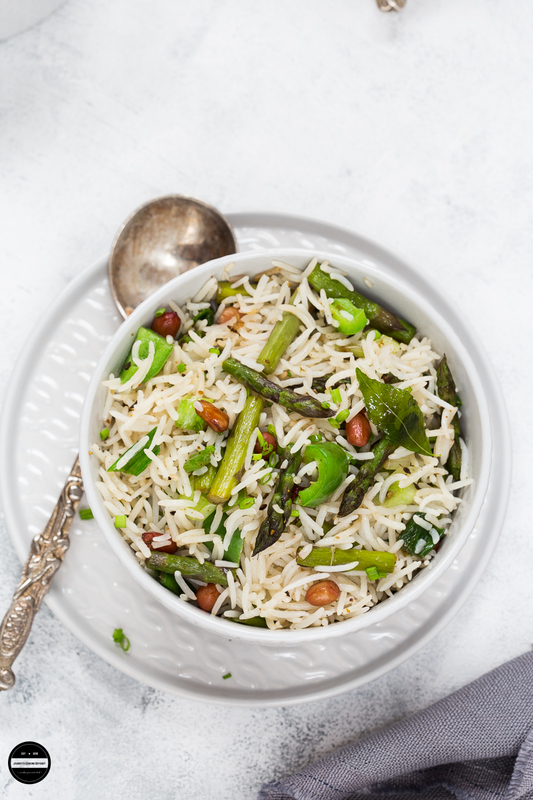 Easy, Asparagus and Peanut Rice, perfect spring dish that is loaded with fresh and tender seasonal vegetables, peanuts and packed with flavours! A healthy, satisfying vegan or plant-based dish can be served at lunch or for mid-week dinner. In my family, while we can, we aim to eat as seasonally as possible to obtain all the goodness and benefits of the produces. 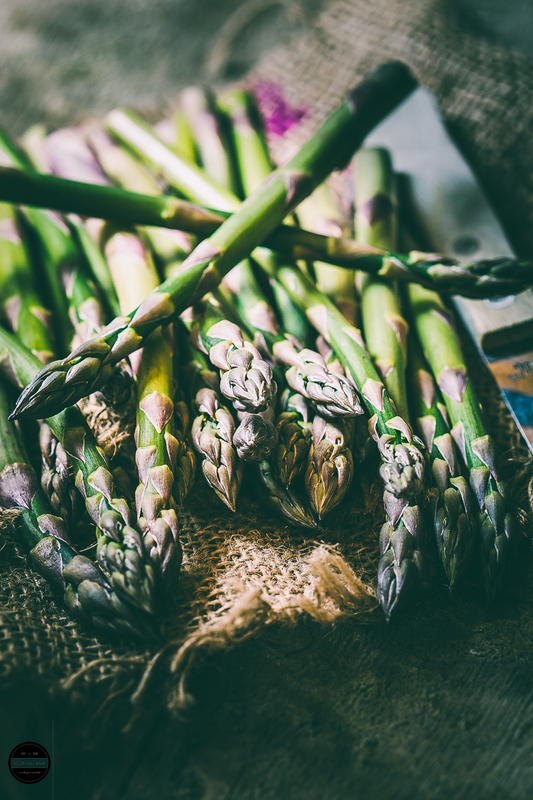 Since the end of April, supermarkets and farmer markets have started stocking up British asparagus, and these are so precious as the season of British asparagus lasts only April to May. We adore them, they are a sure sign of spring and as soon as they appear in the market they also appear in my kitchen too. These tender spears are so easy to use in any recipe, steam, bake , BBQ or just stir fry and enjoy with dressings and sauces. Past couple of years, we started using them in the salad as well. Full of vitamins and antioxidants they are a nutritional powerhouse. 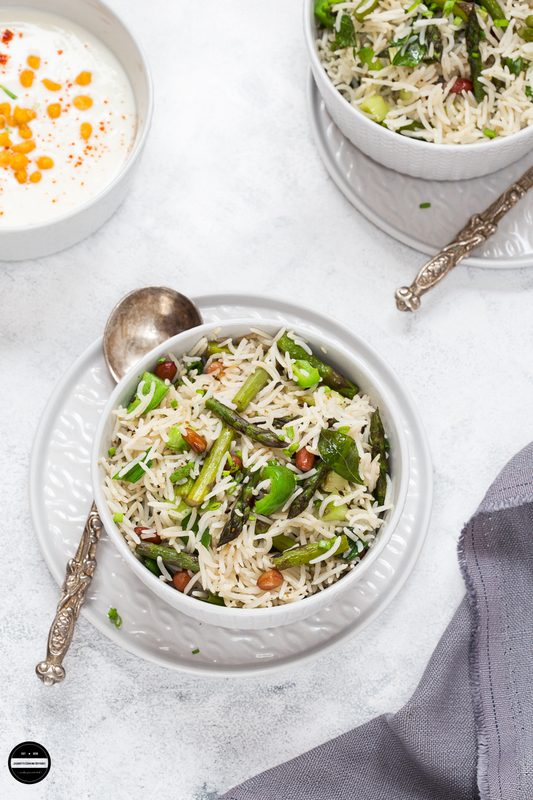 As usual in my weekly shopping this week we had asparagus too and was thinking to churn out a new recipe and just in time daughter asked me to give her an easy and exciting but healthy and filling rice recipe as she is always looking out for a new rice recipe. She is particular in some recipes as she doesn't want strong flavoured dishes, so while I was scanning the fruit and veg box in the fridge, I picked up asparagus, spring onions, capsicum and cooked rice to prepare an Indian flavoured rice. Although I was sceptical, as all these years, I have never cooked asparagus in any Indian recipe, still went ahead with the idea that I had in my mind. So while I was chopping the vegetables, my eyes were scanning my kitchen cupboards for spices or spice blends. I didn't want to make this rice too strong in flavours, so I layed my hands on Sambhar Masala Powder, along with Sambhar masala, I also picked up some curry leaves and peanuts to add a crunch to the dish. As the vegetables were being cooked I started to imagine just how it will turn out as just the aroma was good enough to make my tummy rumble. The result? Perfect Savoury Rice! This recipe came together just under 15 minutes (providing already cooked rice) without any complicated steps. Sounds pretty good right? Okay, I was excited but the proof is in the pudding. 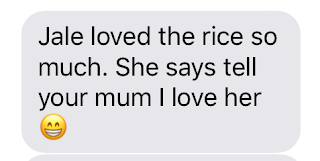 well, the verdict was that we must put this rice dish on our spring/summer menu and just in a week's time I had prepared this rice third time :) Daughter took this rice with her and shared it with her friend, the text appeared on my phone saying this!!! 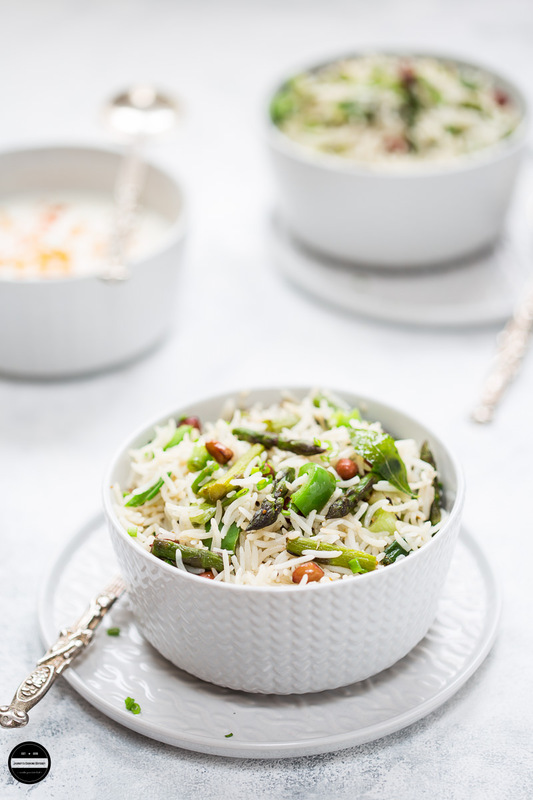 I think you too should totally get on board because it is an easy, fuss-free and super delicious asparagus recipe for your family that can be paired well with any type of raita or mango kadhi. Don't have sambhar masala powder? use curry powder instead. 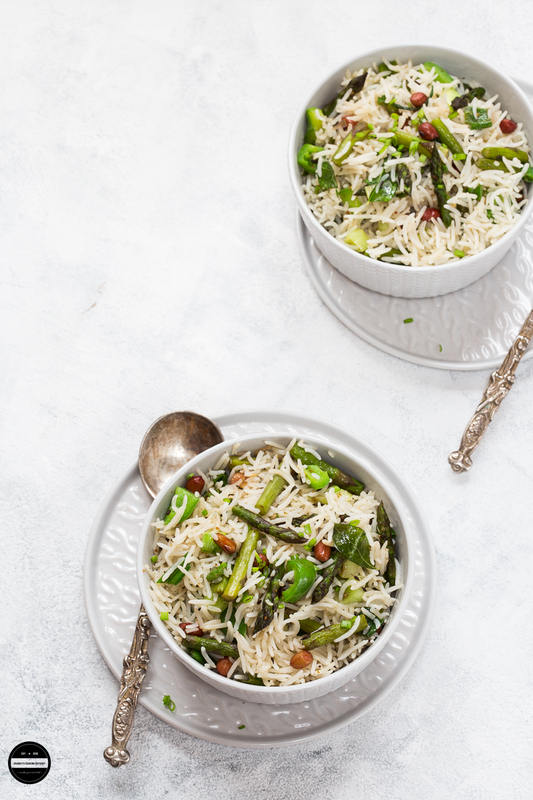 Asparagus & Peanut Rice, vegan, healthy and satisfying which comes together just under 10 minutes. Heat oil in a non-stick pan or kadai. Add cumin seeds, once it splutters add hing and add peanuts. Fry the peanuts for 3-4 minutes on a low heat. Now add asparagus and cook only for a minute. Then add spring onion and capsicum along with curry leaves. Add sambhar powder and cook the masala for a few seconds. Add cooked rice, and salt mix gently. Let the rice heat nicely. Serve with any kind of raita. Sending this dish to A to Z Recipe Challenge. I am loving this dish! All the flavors go so well together. Love new ways to use asparagus! I am in LOVE with your photography!! Such beautiful work! I love all the veggies that you have added which really make this a filling and good for you dish. It's so colorful too! Your photography is to die for. This rice looks incredible!!! Thats an amazing rice, never thought of making rice with asparagus, and i love the addition of peanuts here.LIpsmacking rice. 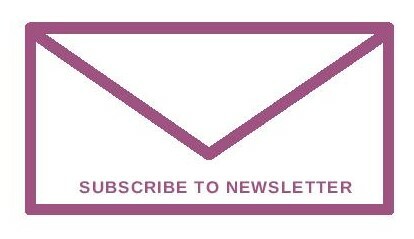 Now you can :) Thanks Priya. What a lovely one-pot meal and a great example of fusion cooking! Beautifully done. I live the simplicity of the dish. Simply delicious. Feel like grabbing a plate and serving myself and digging into it right away. 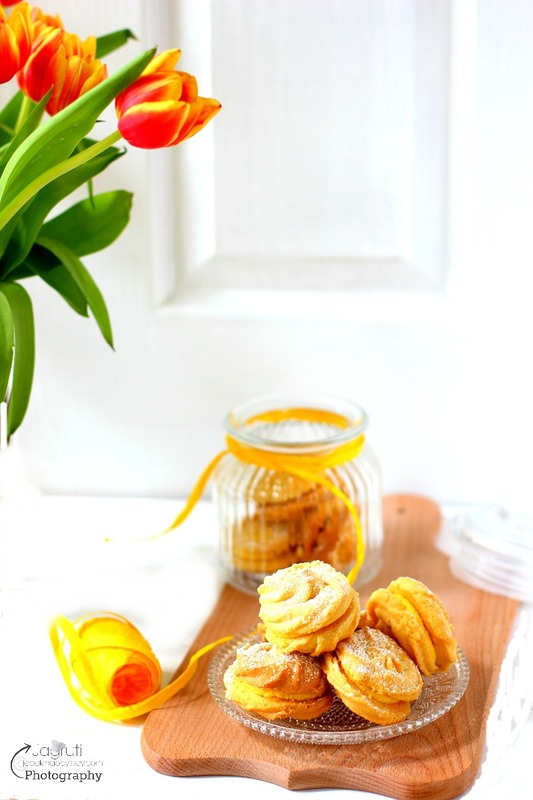 Beautiful recipe and awesome share!Bookmarking this for the future! I love one pot meal. And this rice looks so inviting. Loved your click. I can feel the taste. Superb share. Nice and tasty one pot meal.. I always love these kind of innovative recipes. 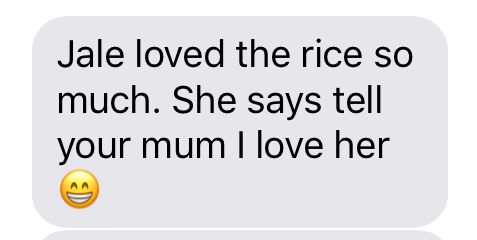 Your daughter certainly inspires you a lot in the kitchen and its such a great feeling when you get the feedback that its even loved by her friends. Loved the recipe, use of Indian masalas to make the Asparagus shine out in the rice dish. OMG what an inviting and delicious looking rice that is. Love the addition of asparagus. I am sure sambar powder must have added so much flavor to the dish. Amazing clicks as always. Thanks Pavani, surprisingly asparagus worked well with Indian masala. That's a delicious looking bowl and it is a nice way to use asparagus. I am yet to try asparagus, I wonder why I haven't tried it yet. Your asparagus peanut rice is inspiring me to try this veg soon. 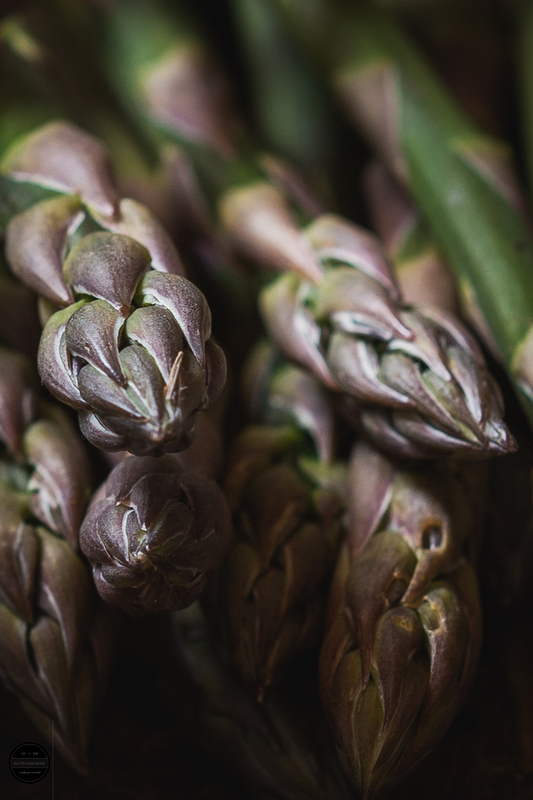 Beautiful clicks and love that dof in the asparagus pic. Really love the sound of this - I wish our asparagus season was longer. Have saved this to try. A lovely recipe using asparagus. Usually when I see a good bunch I don't buy them as I really don't know what to do with them besides grilling them or adding to an omelette. Next time I see tender asparagus I know what I'm making. I love your images. SO MUCH. I am sure the dish tastes as good as it looks. Truly deserves all the accolades it gets! WOW !!! Love the use of asparagus here. such a healthy dish as well as the beautiful pictures.